Welcome to the Dino-Sanctuary…the nesting ground of Dino-mic kids Dinosaur games! Almost two decades ago Steven Spielberg brought alive the gigantic creatures of prehistoric times on the silver screen in his epic movie Jurassic Park. As a 14 year old boy it was a mesmerizing experience for me. I still remember the Wow’s! & Ohh’s! that filled the entire auditorium. Everyone was awe-struck; gazing hypnotically at the screen as if their imaginations had come to life… the mighty Dinosaurs! When the banner sash came falling on the ferocious T-rex in the climax scene reading “Dinosaurs Rule the World”, the affirmative applause from the audience acknowledged the fact. Nothing has changed much since then, rather the fascination for the Dinosaurs have grown over the time among the kids. So, if you are one of the caring parents who want their Dino-fan kid to gorge into some fantabulous kids Dinosaur games or wanting to throw a Dinosaur theme party for your kids and friends, then here are some of the best Dinosaur Video games, Dinosaur Board games & Dinosaur Party games ideas for kids. Also, don’t forget to check out these fun Online Dinosaur games for kids! My Tip: While playing the following Dino-Party games try to infuse more zing into the party by giving dino-mic names to the kidosurus & Buddyraptors like – Peterosurus, Janeosurus, Justinaptor etc. Enjoy! Game Learning: Different Dinosaur species, Handling money. Dino Business – Published by: Playoff games. This Dinosaur theme board game was first published in 2009. In this kids Dinosaur game kids play as investors who want to build a Dinosaur theme park in an island. The players have to roll the dice to get the money to buy the DNA required to re-live the Dinosaur. 30 different Dinosaurs species are available to play with. The game is played in 3 stages. The player with maximum points at the end of the 3 stages is the winner. The game consists of one main game board, one small market supply game board, 60 DNA glass jewels (15 of each color), 40 Dinosaur shaped pieces (10 of each color), a dice, game rules, 30 dinosaur tiles, money tiles and 5 playing pieces. This kids Dinosaur game is fun to play as the game pieces and rules are quite interesting. The overall durability of the game is very good. The board is vividly designed. The Dinosaur tiles and Dinosaur shaped pieces are cool. The DNA pieces are made of round glass jewels. The game requires the kids to buy certain things. This would build money handling and simple calculation skills in them. This kids Dinosaur game is more of a chance game than a strategy game. The game is a good entertainment for kids who are fascinated by Dinosaurs, but doesn’t hold much attraction for grown up’s. Game Learning: Different Dinosaur species. Game Time: 30 to 45 minutes. Jurassic Park III–Island Survival Game – Published by: Milton Bradley. This kids Dinosaur game is based on the Blockbuster movie Jurassic Park-III. The game was first published in 2001. This is a chase and rescue type game. Players have to decide beforehand whether they want to play a killer Dinosaurs or escaping Humans. The humans have to escape through 5 Dinosaurs dominated zones without getting caught by the killer Dinosaurs and reach the beach to get rescued. Various cards and a roll of the dice determine the action sequences. The game comes with a large sized game board, 7 human tiles, 5 different types Dinosaurs pawns, 4 dice, Life chips and chance cards. This kids Dinosaur game is a good option for kids who want some action and some strategy games. The game pieces are very good, especially the Dinosaurs pawns. The overall durability and manufacturing quality is good. All the human characters and the Dinosaurs spices used in the game are taken from the movie. Hence gives a realistic feel. Kids and parents who love Jurassic Park franchise will relish the game. The Dinosaurs species used in the game are 6 Pteranodons, 3 Velociraptors, 2 Spinosaurs, and one T-Rex. The chance cards and the human characters tiles are made of card board that may become worn out in due course of time. This Dinosaur game for kids is a mixture of random chance and strategy, hence it will be enjoyed by kids but may not be as engaging for adults and grown up kids. All the 4 dice are sticker based and therefore can peel off over a period of time. Dinosaurs Extinct – Published by: Briar Patch. This kids Dinosaur game was first published in 2006. The theme of the game is to select one of the 4 available Dinosaurs and make it travel through time, from the pre-historic to the modern 21st century, by overcoming different obstacles and without getting extinct. The game comprises of a large size game board, 4 Dinosaur pawns with bases, 4 Dino life cards, 14 earth even cards and a dice. The kids can choose any one of the 4 given Dinosaurs i.e. Triceratops, Stegosaurus, Corythosaurus or Apatosaurus and make it cross various obstacle like Volcanoes, Gigantic falling Meteors, Ice age & Earthquakes. The game events are such designed that it teaches the kids how difficult it was for the Dinosaurs to survive in those times and how/why they became extinct. The game rules are pretty simple to understand and the game flows quite smoothly. Overall a fun game for kids. the game board is colorful and very durable. The other components of the game like – the dice, game cards, the Dinosaur pieces are all made of good quality thick card board, hence very durable. This Dinosaur game for kids may not be so absorbing for older kids or pre-teens because of limited challenge and re-playability factor. But definitely a hit for smaller kids. A total chance/random based game play. No strategic thinking required. Go, Diego, Go!-Great Dinosaur Rescue (Nintendo Wii) – Brand: 2K Play. The game was released in year 2008. This kids Dinosaur game is an adventure video game in which a players has to navigate Diego, Alicia & baby Jaguar through different prehistoric, dinosaur-filled environments in order to reunite Maia the Maiasaurus with her family at Egg Island. The game has lots of mini-games to enjoy, such as – matching Dinosaur sounds, Play football, Driving etc. The character voices are given by the original artists from the TV show. The game would make the kids do some physical activities during the gameplay. There are over 12 exciting Wii Remote motions like - climbing, flapping, pulling, running, digging, swinging, stomping etc. A cool, violence free, very interactive & cute Dinosaur game for kids. The graphics and sound quality is good and catchy. Game concept and controls are simple and easy to understand. A very good “Beginner’s Video Game” for kids. The game may not entice older kids. The game is primarily meant for smaller kids. The game has a total of 5 stages that are relatively easy and can be completed in a short period of time. Therefore, the game is on a shorter side. Battle of Giants: Dinosaur Strike (Nintendo Wii) – Brand: UBI Soft. This kids Dinosaur game was released in year 2010. This is an action game in which players control a Dinosaur that fights with other Dinosaurs in one-on-one battles. The Dinosaurs try to eliminate each other by biting, clawing, ramming horns, head-butting, tackling, and kicking. Single player, Multiplayer and Tournament gameplay modes are available. 3 different game environments (mountain, dessert and forest) and 18 species of Dinosaurs to choose from. The players can customize their selected Dinosaur and load them with horns & wings etc. The graphics are pretty impressive with Dinosaurs looking very realistic. The background music and Dinosaur roaring sounds are very good. The game controls are good and overall gameplay is quite simple for kids to have fun. A highly recommended game for Dinosaur fanatic kids. The game is equally enjoyable for kids as well as parents. Besides the length of the game there are no noticeable downside of this kids Dinosaur game. Want some more Kids Dinosaur games? OK then… check out another interesting Dinosaur game for kids that is based on the Super-Hit animation movie Ice Age: Dawn of the Dinosaurs. The game is listed in the recommended Kids Video Games section. Kids are always fascinated by Dinosaurs, the gigantic prehistoric animals. 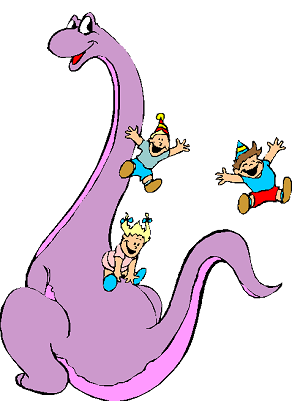 Why not plan your kid’s next birthday party or kids Christmas party on Dinosaurs theme? Following are some of the kids Dinosaur games ideas that you can blend with any Dinosaur theme party offerings. Let’s make this kids party Rrroarring with these Dino-mic games! Game Objective: In this kids Dinosaur game the players have to cross the Dino-theme obstacles to win the race. A few hard boiled eggs with their outer shells intact. Some Dinosaurs posters (preferably T’rex). Bone shaped candies or chocolates. Choose an open area like your front yard or back yard where you can set the course of the relay race. Draw a start line and a finish line roughly 20-30 steps apart from each other. Create 4 Dino-theme obstacles, as follows, and place them evenly between the start line and the finish line. First obstacle will be – Dino-Foot. To create this take some empty cornflakes boxes and cut out a hole on the front-center face. The hole should be of the size such that the kids can slip in their feet into it. Make one such pair for every player. Second obstacle will be matching the Dino-Cards. There are lots of Dinosaurs matching cards games available in the market in which kids can match Dinosaurs pictures with their respective names or skeletons etc. They are pretty inexpensive to buy. Third obstacle will be Dion-Egg eating. Boil some regular eggs and keep them ready beforehand. Fourth and the last obstacle will be tossing the bone shaped candy through the Dinosaur’s mouth (poster) that is hung at a fair distance. On the Dinosaur poster cut out a circular hole near the mouth of the Dinosaur. The hole size should be such that the candies can be easily tossed through it. Give some popular Dinosaurs names to every player like – Raptor, T’rex, Parrosaurus & Sinosaurus, etc. and let the race begin. As the stop watch starts the first kid begins his race from the start line. At first, he has to wear the Dino-Foot on both his feet and then run towards the second obstacle and match the Dino-cards. It should be pre-decided as to how many cards a player has to match. Ideally, 5 to 8 is good enough for kids. Afer this the player has to move to the next obstacle i.e. Dino-Egg eating. First he has to peel off the outer Eggshell and then eat the whole egg. Finally, he has to pick up the bone shaped candies/ chocolate and toss them through the Dino’s mouth (poster). Each kid will be given 5 candies to toss. Note the stop watch time as soon as the kid crosses the finish line. Similarly, all the players will take turns to finish their relay course. Tally the timings and the kid who has taken the shortest time will win this fun kids Dinosaur game. My Tip: If you have sufficient space and required supplies then let this relay race unwind with all the players racing simultaneously. This will make this kids Dinosaur game more live and bubbling with fun. Before we move forward & explore more kids Dinosaur games ideas, take some time to have a look at some of the best Dinosaur Party Supplies that you might need to make your kid’s birthday Dino-Special! Note: The merchants recommended above have been carefully chosen, so you can be rest assured about their product, delivery and service quality. Game Objective: This kids Dinosaur game is played on the lines of musical chair. Plastic Easter eggs filled with candies. A CD player playing some Jungle music. Place your dining table at the center of a clear area. Create a virtual Dino-Nest out of it by using your bed sheets. Put one bed sheet on one half the table and other on the second half of it leaving a gap of 1 feet between them. Put another bed sheet to cover the top of the table and drape the extra length around the table and hold it in place using safety pins. Idea is to create a sort of Dino-Nest having 2 openings, on at the front and one at the back. Secure the bed sheets in place using safety pins such that once complete it gives a look of a small hut. To give it a feel of a Dino-Nest you can decorate it with pictures and posters of T’rex & Raptors. You can also stick some Dinosaur bones and skeleton pictures around it. Cut out a round card stock paper and write “Jurassic Park” and stick it just on the top of the “Entry” opening. Put all the candies in the plastic Easter eggs and place them inside the Dino-Nest. Before the game starts instruct the kids that they are Paleontologists (Dinosaur Fossil specialists) who are searching for some Dino-Egg for research purpose and they have to crawl inside the Dino-Nest from the Entry door, one by one in a circular fashion , pick up a Dino-Egg and get out from the back door. Line up the kids and let the fun begin. An adult can play and stop the music. The kid who gets trapped inside the Dino-Nest, when the music stops, will be eliminated. The last kid remaining would win this fabulous Dinosaur game for kids. Game Variations: One can create some variations in this game using one’s own imagination. This kids Dinosaur game can also be played with a Dog theme. Just replace the Dinosaur eggs with some Dog bone shaped candies. Click here to know more. Game Objective: A kids Dinosaur game where kids have to pin the horns of a Triceratops Dinosaur. White chart paper/ construction paper to make Dino-Horn. Stick the Dino’s poster on the wall. Let him go ahead and stick the horn on the poster. Kid who has placed the horn closest to the actual position WINS this evergreen Dinosaur game for kids! This evergreen kids Dinosaur game can be played as a birthday party game like pin the Hat of the Pirate! Or pin the magic wand of Harry Potter!!! Other kids waiting for their turn can try to confuse the blindfolded kid by saying up…down…a little bit left, slightly right…Let the kids Dinosaur game party go wild! Game Objective: In this kids dinosaur game the players have burst as many Dino-Eggs as they can to win the race. A few packets of white colored balloons (preferably oval shaped). Blow all the balloons beforehand. Lots of them! Put all of them at one side of the room and make the kids stand on the opposite side, behind the start line. Divide the kids into teams of two and make each pair stand at one hand’s distance from each other. Fix the time limit for the relay. 5 minutes would be the ideal. As the relay starts, one player of every team team would rush toward the Dino-Eggs (balloons), grab one, burst it by sitting over it and rush back to tag his/her waiting partner. At this, the second kid will now rush towards the Dino-eggs and the relay continues in this fashion till the allotted time gets over or all the Dino-Eggs gets exhausted. Count the total number of Dino-Eggs busted by each team and declare the winner of this tickling kids Dinosaur game.